The DxO OpticsPro workflow is based essentially on automatic support for your camera’s RAW format and on the automatic correction of your lens defects by applying a corresponding DxO Optics Module. 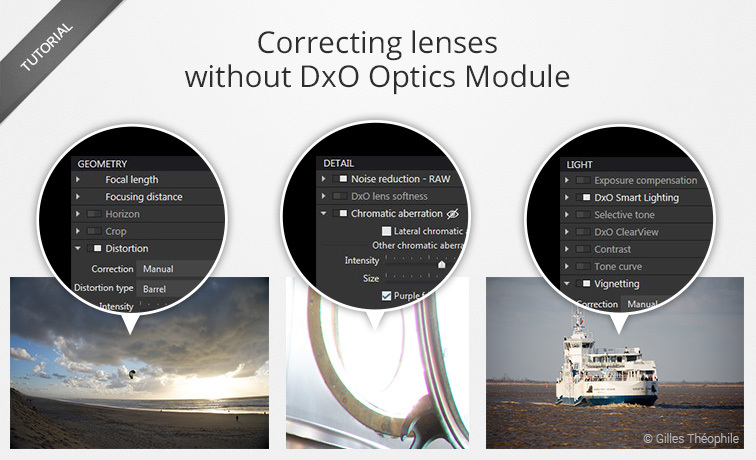 In case there is no Optics Module for your equipment, you can easily learn how to use DxO OpticsPro’s manual tools, notably to correct vignetting, chromatic aberration, and distortion, as well as to optimize the sharpness of your images. DxO is working to support as many camera/lens combinations as possible, and currently offers thousands of Optics Modules that are automatically downloaded, installed, and applied when you open your images in DxO OpticsPro. 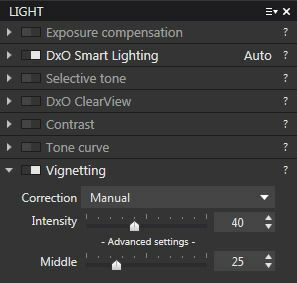 When you open a photo in DxO OpticsPro, the software recognizes the type of equipment you used by reading the image metadata. The associated DxO Optics Module will then automatically correct vignetting, distortion, and chromatic aberration, and will also optimize lens sharpness by reinforcing the sharpness as well as making it more homogenous — that is, by ensuring that there is little or no difference between the sharpness in the center and that of the edges of the image. But what happens if your lens is not supported — that is, if there’s no DxO Optics module for it? In this case, you will not benefit from automatic optical corrections, but you will find all the manual tools you need to correct optical defects in the Customize tab. The absence of a DxO Optics Module can be explained in different ways: it could be that the lens is too rare, too old, or too recently introduced to the market, or it is not capable of transmitting certain information to the camera (which saves the information to the image metadata on which the corrections in DxO Optics Modules are based). in the upper right corner of the thumbnail. In the DxO OpticsPro DxO Optics Modules menu, you can see which DxO Optics Modules are being planned and you can suggest adding an Optics Module. You will find additional information about automatic corrections, support for RAW files, and Optics Modules in the dedicated FAQ. Making corrections in the right order is paramount. For example, you will need to fix vignetting first, because that can have a strong influence on the tone of the image, since you will need to adjust your photo’s luminosity. You should make corrections having to do with sharpness last. 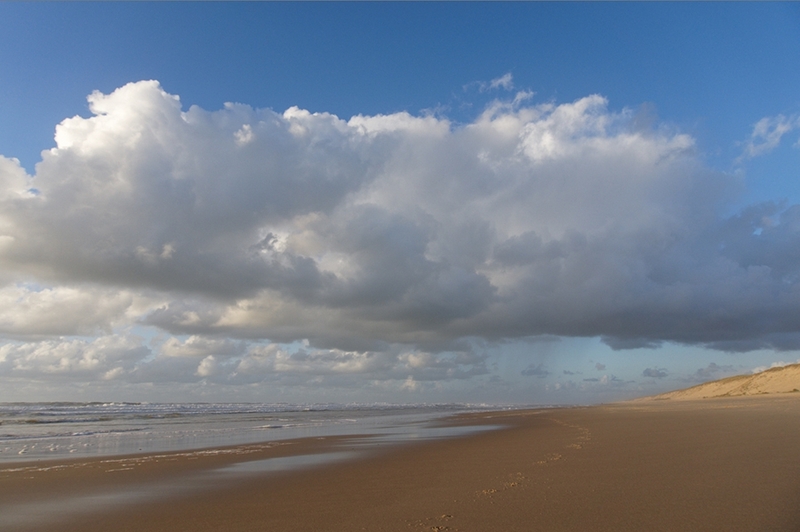 Image before correction, showing marked barrel distortion on the horizon line, and strong vignetting (darkening in the corners). located at the top right of the relevant palette. Go to the Light > Vignetting palette. Move the Intensity slider to the right to compensate for darkened edges. You can also adjust the strength of the correction by using the Middle slider (stronger towards the right). If necessary, after you have corrected the vignetting, you can proceed to make adjustments to the overall tone (i.e., the luminosity and contrast). 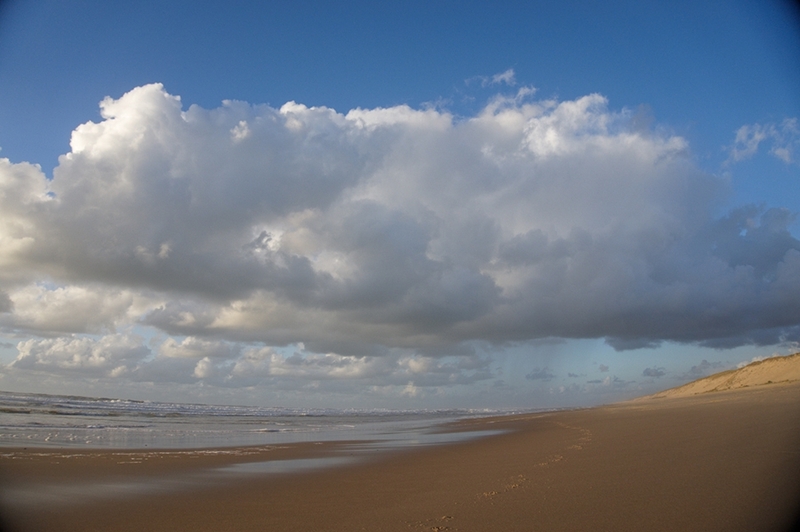 Correction of vignetting from a zoom lens used wide-open. Vignetting sub-palette in the Light palette. Go to the Geometry > Distortion palette. Make sure the Correction menu is set on Manual. In the Type menu, choose the type of correction – Barrel or Pincushion – depending on the kind of distortion that is visible in your image. Use the Intensity slider to correct your image (weaker to the left, stronger to the right). 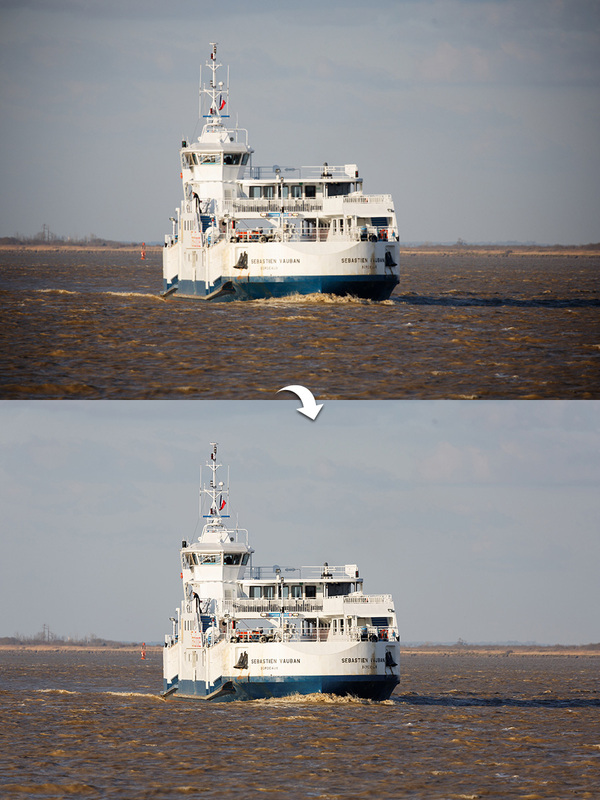 Correction of massive distortion from a standard zoom lens on a hybrid camera. Note that there is also very marked vignetting in the original. Distortion sub-palette in the Geometry palette. To check that your lines are straight, you can display the grid by pressing Ctrl+G; you can hide the grid by pressing Ctrl+G again. The Type menu contains a third option – Fisheye – for correcting the excessive distortion characteristic of these lenses, and to obtain an effect equivalent to that of a rectilinear lens. the grid by pressing Ctrl+G again. Chromatic aberration appears as a colored fringe along high-contrast edges of subjects, and it is particularly visible on the periphery of the image. The most frequently-encountered colored fringes are red and green (lateral aberrations), purple or green (longitudinal aberrations), or just purple (associated with high contrast). 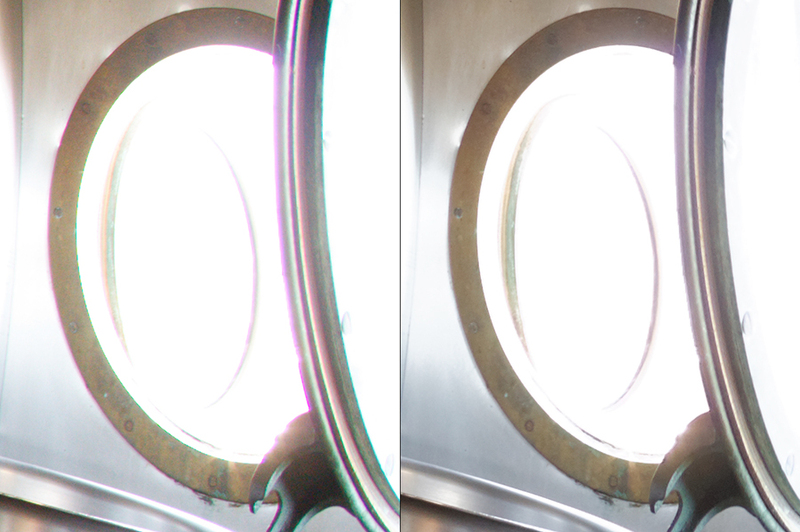 Managing the correction of chromatic aberrations is very particuliar: in effect, DxO OpticsPro applies an automatic correction to this lens defect. A generic correction based on an analysis of the image is applied in a systematic way. This is complemented by a correction based on the data in the Optics Module when it is available. You can thus use Chromatic Aberration sub-palette to correct this defect in case there is no Optics Module, so as to make your own adjustments to the generic correction applied to your image. Lateral chromatic aberration checkbox is inactive if there is no DxO Optics Module available. Go to the Detail > Chromatic aberration palette. The Intensity slider lets you adjust the correction of purple or green fringes: stronger towards the right, weaker towards the left. To return to the automatic default correction based on image analysis, click on the magic wand on the right. The Size slider adjusts the width of the correction on the fringes. Clicking on the magic wand to the right will let you return to the automatic correction. 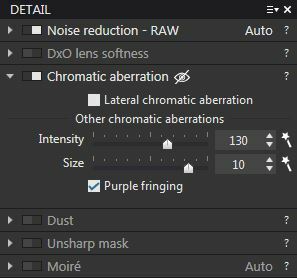 The Purple fringing checkbox activates the algorithms optimized for processing this kind of aberration, which is frequently found in very high-contrast areas, for example, the backlit branches of a tree against a bright sky. 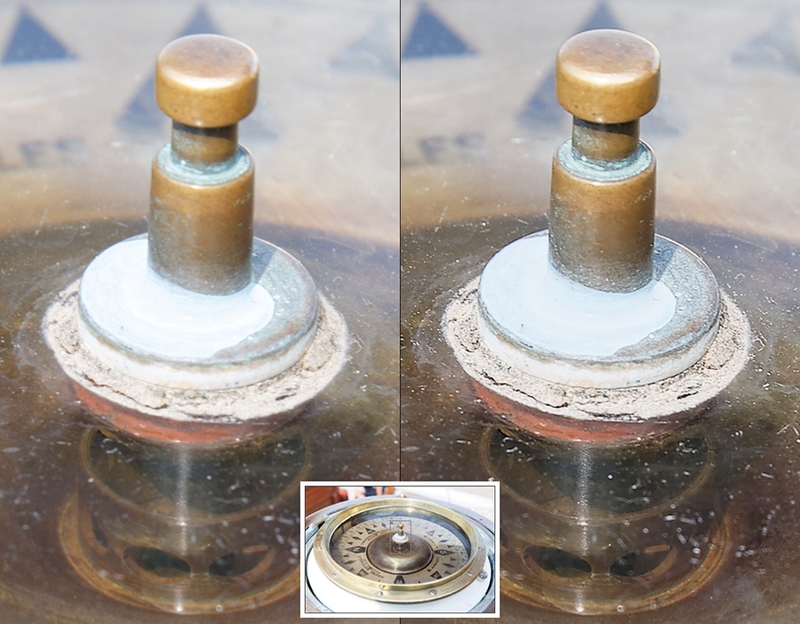 Correction of chromatic aberration in a very high-contrast area on the edges of an image taken with a fisheye lens (seen at 100%). Chromatic aberration sub-palette in the Detail palette. Excessive settings for the Intensity and Size sliders can have an impact on the colored details in the image. 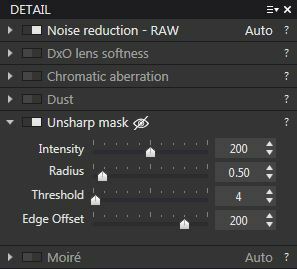 To optimize the sharpness of images taken with a lens that is not supported by a DxO Optics Module, you can use the Detail > Unsharp Mask sub-palette; in particular, the Edge slider will let you reinforce the sharpness on the edges of the image (where sharpness is always weakest), in order to achieve a more homogenous result over the entire image. For more information, please consult our tutorial Enhance the sharpness of your camera with DxO OpticsPro, paragraph 2. 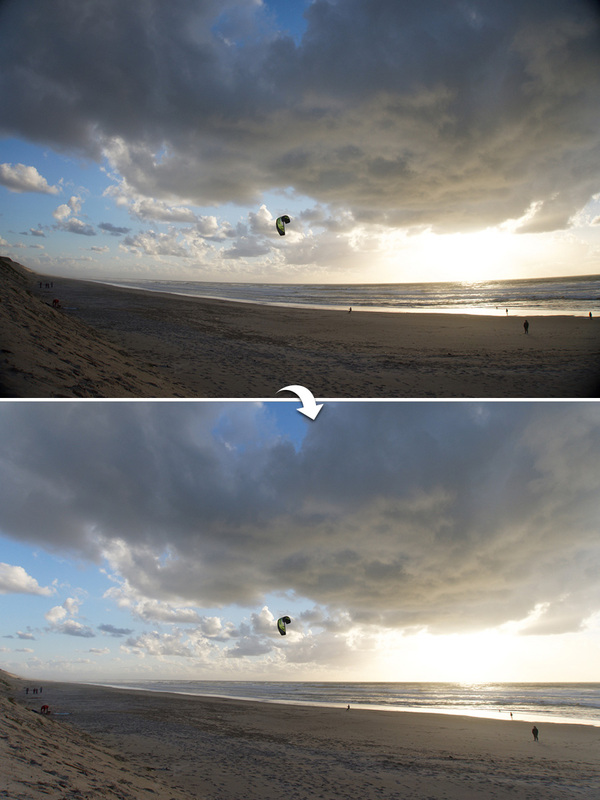 Sharpness optimization (detail at 100% in the embedded image). The Unsharp mask sub-palette in the Detail palette. 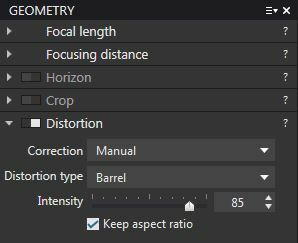 After you have found the right correction parameters for your lens, you can save it as a preset in order to use the same settings again on other images. Warning: Optical defects vary, depending on the lens you use, the focal length, aperture, and sometimes even the focusing distrance. You may have to create several different presets that correspond to different shooting parameters. For more information about DxO OpticsPro presets, see our tutorial.